I seem to recall author Michael Ruhlman tweeting his hopes that someone for this month’s Charcutepalooza challenge would make pastrami. Well, here it is: my version of venison pastrami, brined and smoked. I had this gorgeous plate for breakfast–a hot pastrami on rye, without the rye. I’ve always wondered what the difference is between pastrami and corned beef. The latter is brined, then boiled. Pastrami goes through a process somewhat more elaborate, meaning it is smoked after the brining. 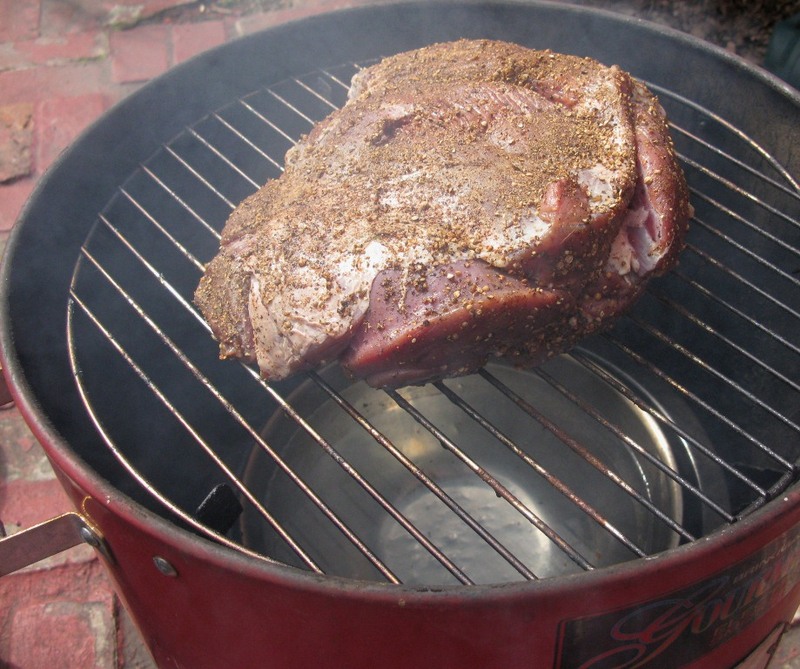 It’s not terribly difficult, especially if you have a home smoker like our little Brinkmann unit. But I skipped the beef part and instead used the hindquarters from the venison our neighbor recently gifted us. They have a farm in Virginia and trade the venison they kill there for vegetables we grow in our garden here. In his book Charcuterie, Ruhlman calls for a brine consisting of 1 gallon of water, 1 1/2 cups (350 grams) kosher sale, 1 cup (225 grams) sugar, 1 1/2 ounces (42 grams) pink salt, 1 tablespoon (8 grams) pickling spice, 1/2 packed cup (90 grams) dark brown sugar, 1/4 cup (60 milligrams) honey, and 5 minced cloves of garlic. Combine the brine ingredients in a pot and bring to a simmer, stirring until the salt and sugar are dissolved. Let the brine cool to remove temperature, then refrigerate overnight before adding a 5-pound piece of beef plate or brisket (or venison hindquarter). Weigh the meat down, as with a ceramic plate and a Ziploc bag of water, so that it remains submerged for at least 3 days. Since my venison ham was pretty thick, I brined it for an entire week. After removing the meat from the brine, rinse it in cold water and pat dry with paper towels. Then smear it all over with a dry rub consisting of 1 tablespoon (8 grams) coriander seeds, lightly toasted, and 1 tablespoon (10 grams) black peppercorns, lightly toasted, ground together roughly with a mortar and pestle. Heat-smoke the beef (or venison) using your favorite wood chips, such as hickory, until the meat reaches an internal temperature of of 150 degrees. It was pretty chilly the day I did this, so I pulled the meat when darkness fell. My instant-read thermometer put the internal temperature around 142 degrees. To serve your pastrami, place it in a heavy pot with about 1 inch of water and cook for 2 to 3 hours, according to Ruhlman, or until fork tender. Venison is so lean, I only left ours to cook for 1 1/2 hours. It stores perfectly in a plastic bag in the refrigerator. To reheat, I cut off slices and place them in the steamer. On that note, I should add that I sought advice on how to do this from meat Meister Bob del Grosso. He recommended larding the venison with fat or else prepare for a “rasp on the tongue.” I had every intention of larding, something I had never attempted before. We even purchased a $14 larding tool over the internet. But in my eagerness to get the venison on the smoker I completely spaced out that step. I wouldn’t call the meat raspy, exactly, but it is leaner than your average pastrami. That’s why I recommend steaming it if you need to reheat it. Otherwise, our rye-less hot pastrami on rye–with fresh sauerkraut and Swiss cheese melted under the broiler–was divine. If you have another hind of venison, you should do another batch of pastrami (larding this one) to compare the results. Would be an interesting experiment! That looks absolutely delicious. Delora, I do in fact have another venison hind, but it’s already spoken for. It’s being turned into prosciutto. But I absolutely agree–we should do this again and lard it. 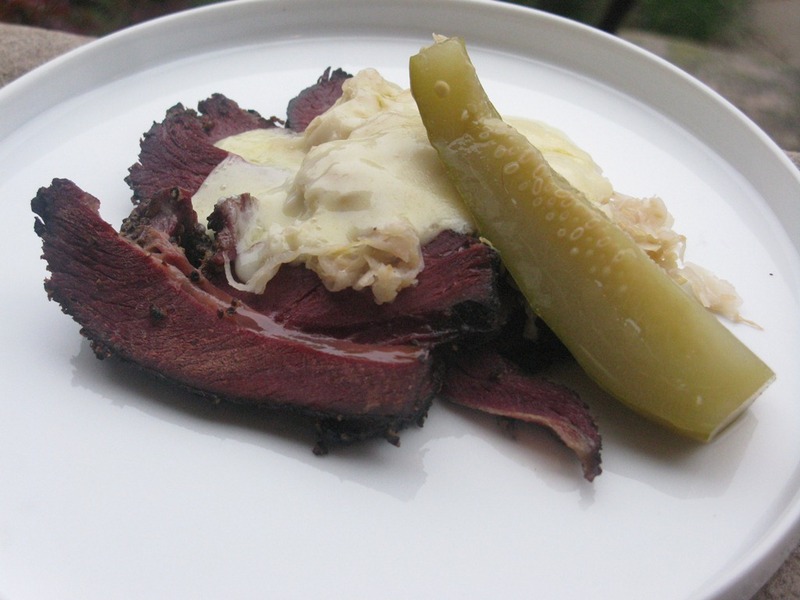 Thanks a million for posting the Venison Pastrami, I like those do it at home recipes…and this one sounds delicious. Venison Pastromi sounds great as the venison meat is sometimes very strong. My nephew hunts deer and elk in Colorado and I am going to tell him about your recipe. Thanks.